Glendale's #1 Window Tinting Shop! United Tint is a Authorized Window Film Dealer and only uses brand window film. Glendale, CA's #1 Car Window Tint Shop! 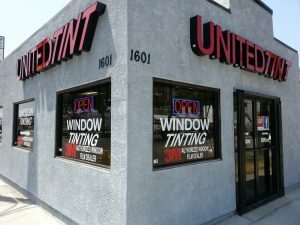 We at United Tint are your local car & home window tinting professionals. We’re conveniently located right in the heart of Glendale, CA. We provide the essential skill needed to maintain that “showroom-new” look. Window tinting is a big plus for your vehicle, but only if it’s done right. Look to our skilled, highly trained technicians to successfully handle any make or model car. We offer a wide variety of shades; select one that meets your personal goals for the look and the level of security that you want. We try our very best to keep your door panels clean during the entire tinting process. All work at United Tint comes with a 100% satisfaction guarantee as well as a lifetime warranty on the tint film by 3M. Stop in anytime, we tint cars on a first-come, first-served basis! Window tinting is one of the simplest ways to improve both the look and the feel of your car, truck, or SUV. As you improve both the look and the comfort of your vehicle, you’ll also enhance its value while protecting whats inside the vehicle from harmful UV rays and heat from the sun. Once your window tinting is complete, you’ll notice how much cooler and more comfortable your vehicle will be. Plus, a cooler interior means less work for your air conditioning unit. Your AC will last longer, and you’ll enjoy better fuel economy. Those savings can add up as time goes by. Tinting makes your interior less likely to fade or to crack. It even makes your window glass safer, as it helps to hold glass together in the event of breakage. Think of all the interior elements that suffer from excess heat and/or UL light — floor mats, dash, carpeting, vinyl seats, leather seats, and YOU! That’s right! Tinting will reduce that “greenhouse effect” that can heat up your vehicle and reduce your comfort. Plus, cut UV light levels, and both your eyes and your skin will benefit over time. Many times, we ignore just how much UV light is being absorbed during those hours behind the wheel. Ultraviolet light is even associated with some forms of cancer. Need your old window tinting removed? No problem! Our skilled techs apply special chemicals to first soften the old tint. Then, they use special tools to safely and effectively remove the old material. “Made in the USA” — United Tint proudly uses products and materials made in the United States. And, don’t forget our satisfaction guarantee! Wait in comfort while we complete your window tinting! Our customer lounge offers FREE Wi-Fi, refreshments, and comfortable seating. Call for Free Estimate & Drop Off Your Car Anytime! We work on a first-come, first-served basis!